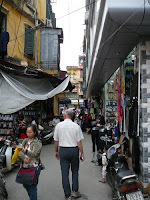 After Halong Bay, we returned to Hanoi for a day before heading to Sa Pa. 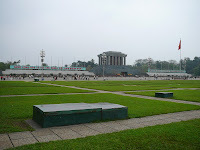 So, we walked over to see the buildings of state, like the presidential palace, etc. Nearby, you pass some funny embassies that must be legacy for the rest of the world's [former] communist era. Prominent locations are held by Romania, Poland, Ukraine, and of course China. I think we did see the Swiss embassy, but no others. All the other guys are probably in a back alley somewhere. 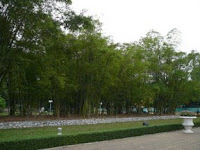 Ho Chi Minh has a mausoleum next to the palace. My understanding is that upon death, he asked to be cremated and have his ashes spread between the north and south of the country. So he was embalmed by the state instead; bummer. 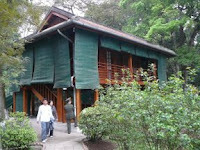 We did take a tour of the palace grounds, which included the state gardens and Ho's house, the house on stilts. Its next to a stocked fish pond and a bomb shelter. What a strange existence that must of been. Our tour guide was curious about two things: 1.) 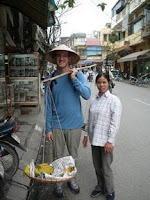 if we, as Americans, held any resentment towards Vietnam today, and 2.) how much we planned to tip him. Very capitalist, these communists. On the way back, we walked by the Citadel, on grounds which was once part of the imperial city way back when Vietnam had kings. The French cleared all that, and left behind a few buildings, like the gate in the photo. 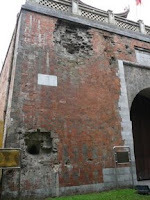 Note the craters in the wall, put there by cannon fire. Probably by angry cyclo drivers that could not get a commission from American tourists. Walked through more city streets, had fun with passports (Hi Bionica) and eventually made it back to where we started. Good show.